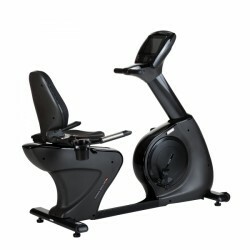 Joint-gentle cardio training of commercial level is offered by the Taurus commercial recumbent exercise bike 10.5 Pro. It convinces by comfort, excellent durability, and stability as well as a soft, modern design. The Taurus commercial recumbent exercise bike 10.5 Pro offers extraordinary training features. The multiple adjustable seat is comfortably softly padded, incline of rest is variable from 45 to 90°. The lumbar vertebra zone has a rest with upholstery, relieving additionally the back. Workout is very joint-gentle thanks to perfectly arranged mechanics. The recumbent bike is equipped with a very sturdy frame construction to be able to cope with frequent, intensive use at gyms. Height levelling in feet gives additional stability. The Taurus commercial recumbent exercise bike 10.5 Pro is controlled by a touch screen. It works very quickly and easily. 20 programmes can be selected. Six of it are for pulse zone training. 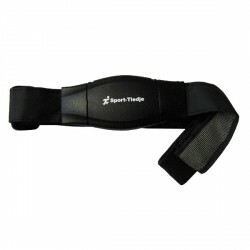 Pulse is measured by hand sensors on the seat handles or with a separately available chest strap. Special programmes for reducing weight, interval training or constant resistance are offered by the commercial fitness equipment. The resistance of the recumbent exercise bike is variable from 40 to 350 Watt at 60 RPM. It offers a wide range of performance which is suitable for beginners as well as regular users. Under the precious cover, the exercise bike technology of the latest generation can be found. The flywheel of 10 kg makes the workout very smooth. Thanks to a two-layer belt drive, the workout remains joint-gentle and very silent even for high intensities. The Taurus commercial recumbent exercise bike 10.5 Pro is independent of external power sources, because it can supply itself with energy thanks to a generator drive. It can be set up everywhere in the facility and even saves energy consumption. 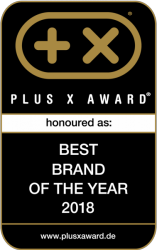 Taurus commercial recumbent exercise bike 10.5 Pro add to comparison list.